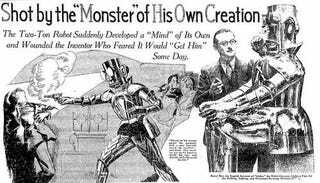 From the research desk of pulp encyclopedist Jess Nevins comes this incredible find: A story from 1932 about how roboticist Harry May was shot by his own robot on stage in England. The article concludes by talking a lot about "recent" science fiction about robots, and how all that SF is now coming true! What you see above is the headline for the whole article, which you can read in totality here, via a PDF on Nevins' blog.